Just scroll down to download links, if you don’t want to hear my undiplomatic Pravachan hahaha. “Public Administration is best for working professionals, it is very easy, can be taken by graduate from any stream, can be managed in a few months, has lot of synergy with general studies blah blah blah”….this is a common sales pitch is used by coaching sirs to get new customers. Now that UPSC reformed the General studies syllabus for mains, they’re making even higher claims about Public Administration vs GS synergy, with specific emphasis on the newly introduced ethics paper, as if all the 1000 vacancies are reserved for Public Administration candidates only. Anyways, they have to paint rosy good picture, because some of them have families to feed and some of them just want to mint truckload of cash beyond what is necessary to maintain an upper-middleclass life style. Same goes geography, sociology, political science, anthropology etc. Yes, the length of syllabus, synergy with GS, availability of books and guidance, graduation background….all those factors should be considered before picking up a subject but don’t pick up a subject only based on somebody’s sales pitch. 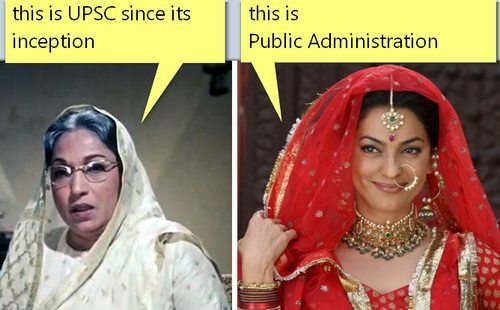 Public Administration used to be the perfect wife so UPSC decided to play Lalita Pawar in CSE 2012- in terms of unpredictable questions, merciless evaluation and scaling. Many sincere candidates ended up with ridiculously low two-digit scores. But whether you should keep Public Administration or leave her, that decision should not be made on the statistical inference from the two-digit scores in CSE-2012 alone, because there is no guarantee that UPSC won’t play Lalita Pawar again when you get a new bride (sociology, political science etc.) in 2013. Besides, despite what happened in CSE-2012, there are toppers in the final list, with Public Administration optional and same will happen in CSE-2013 as well. My point being: One should be careful about optionals just like in marriage and divorce. Decisions should not be made in haste during the heat of anger or passion or at the insistence of a third party. X subject is good because 50 people were selected from there, and Y subject is bad because only 20 people were selected: please don’t use that criteria for subject selection. All you need and all you can occupy is just one seat in the final merit list. UPSC is not about statistics of masses, it’s about an individual’s determination, perseverance, hard work and of course, good luck. Anyways, to survive in the present environment of UPSC, one should expand his reading; maintain, update and revise his notes on regular basis; and practice answer writing. So far as Public Administration goes, IGNOU still has its uses, so here I’ve compiled its BA, MA (direct downloads for full sets, no registration needed) + notes of three toppers + last 34 years papers of Public Administration (1979-2012). 7-zip (for unzipping the files) click me. Reason for using 7zip, because it provides extreme level of compression. MA Public Policy set is almost 70MB but 7zip compressed it down to just 9MB. Now here is the index and syllabus of BA and MA course + official syllabus of UPSC Public Administration Mains. Participative Management (R. Likert, C. Argyris, D. McGregor). Riggsian models and their critique. Women and development – the self-help group movement. State theories and public policy formulation. Management aid tools like network analysis, MIS, PERT, CPM. Legacy of British rule in politics and administration. Constitutional Amendments (1992) and decentralized planning for economic development and social justice. Role of Comptroller and Auditor General of India. Development dynamics, politics and administration with special reference to city management. BPAE 104 for 2016/2017 in English not available? How can I get it ? Sir, I require IGNOU History MA notes in English. Please provide me. your work to gather all the stuff and presented at one location really appreciable. HOW WILL I GET ?